The Warped Mansion is the fourth attraction in Mario vs. Donkey Kong: Mini-Land Mayhem!. A giant wall is seen in the background, as well as a big window. The main transportation means in this level are Green Pipes, which the player can tap and place in the green pipe outlines. They can only use two at the same time, though. Enemies here include Shy Guys, Circus Kongs and Piranha Plants. 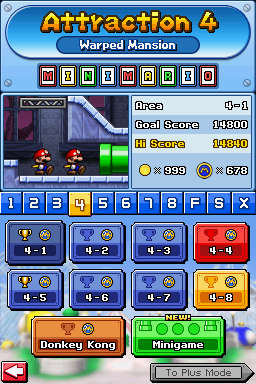 Like the previous level, in 4-4, there is a Mini Peach and a Mini Toad to rescue. In all levels in Plus Mode, Mini Pauline will appear. In 4-4, there is the Mini Pauline Toy Capsule and a Mini Donkey Kong capsule to rescue. 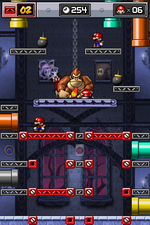 During their fourth encounter with Donkey Kong, the Mini Marios must use girders and colored warp pipes to reach a bomb near the ape, and throw it at him. Donkey Kong often slams the ground, which causes two Boo Guys in two portraits to wake up and attack the Mini Marios. If they manage to land safely, they'll transform into blue flames and serve as traps for the player. If the Mini Marios manage to hit Donkey Kong with bombs three times, he'll take Pauline and flee to the fifth attraction. This page was last edited on December 23, 2018, at 19:04.